This just may be the week that I buy my dream house, three stories, twelve rooms, a balcony and cathedral ceilings on the top floor. 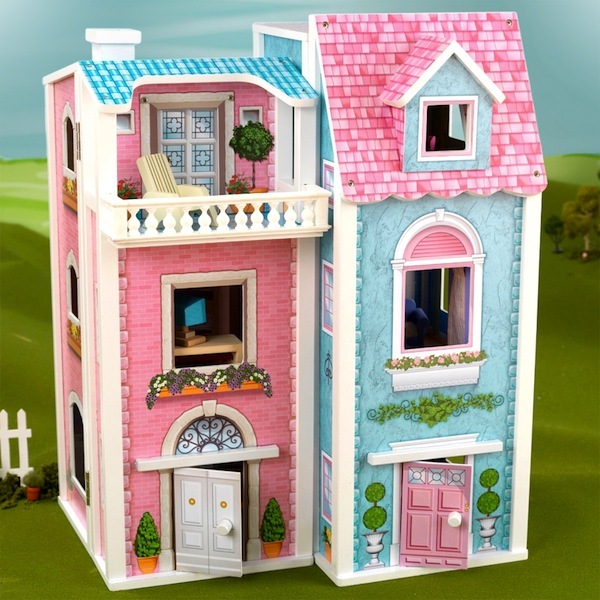 I make no attempt to hide my toy snobbery, those who know me will attest to that, and this doll house would happily be welcomed through my door. It comes with twenty-seven pieces of beautiful wooden furniture and three dolls, but what really appeals to me are all the details that have been included. The rooms are all wallpapered in different patterns, complete with cute artwork on the walls, the verandah has a topiary plant on it (swoon) and when you fold it up, you can see your interior design through the open windows. Plus, it’s wooden, so that’s me sold. Normally $199, it’s on sale from Fat Brain Toys for US$154. Yup, it’s settled, I’m going to do it, one Deluxe Townhouse please. Unfortunately I will need a reshipper as they don’t ship this one to Australia but I’m sure it will be worth it.